Mr. Rentsendoo Jigjid, an Alumnus of the Faculty of Textile Science and Technology and former Minister of Mining of Mongolia, is Awarded "The Order of the Rising Sun, Gold and Silver Star"
Mr.Re Rentsendoo Jigjid at "Shinshu University International Exchange Meet Up" in November 2016. The Government of Japan announced the recipients of the 2018 Spring Conferment of Japanese Decoration in April and the Order of the Rising Sun, Gold and Silver Star was conferred to Mr. Rentsendoo Jigjid for his contribution to promoting friendly relations and mutual understanding between Mongolia and Japan. He is an alumnus of the Faculty of Textile Science and Technology of Shinshu University and former Minister of Mining of Mongolia. Mr. Jigjid was enrolled at the Faculty of Textile Science and Technology of Shinshu University as a Government (MEXT) Scholarship Student from 1981 to 1985. After graduation, he was active as Ambassador of Mongolia to Japan, Minister of Mining of Mongolia and currently he is Vice President of Mongolia Japan Partnership Association. He has been working on development of Japan-Mongolia friendly relations for many years. 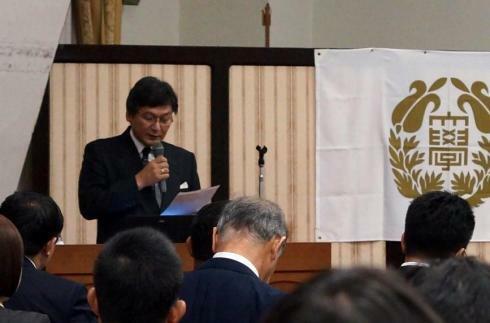 Mr. Jigjid gave a keynote speech at the "Shinshu University Alumni Association in Tokyo" held in February 2008 and also gave a lecture at "Shinshu University International Exchange Meet Up" in November 2016. After graduation, he continuingly provides a great support for all collaborative activities with Shinshu University. "Shinshu University International Exchange Meet Up 2016 Held on November 26, 2016 at the Gakushi-Kaikan, Tokyo, Japan"
"Shinshu University Tokyo alumni association held on February, 2008"